Once upon a time, signature guitars were reserved for players who found fame via the live stage and recording studio, but YouTube has disrupted that paradigm and made household names of vloggers, some of whom now boast bigger audiences than the rockstars that inspired them. Head honcho of Andertons Music in Guildford, UK, Lee Anderton is also the face of the brand’s hugely popular YouTube channel and thousands of guitars pass through his hands each year, so he’s undoubtedly in a position to offer a worthy contribution when it comes to guitar design. 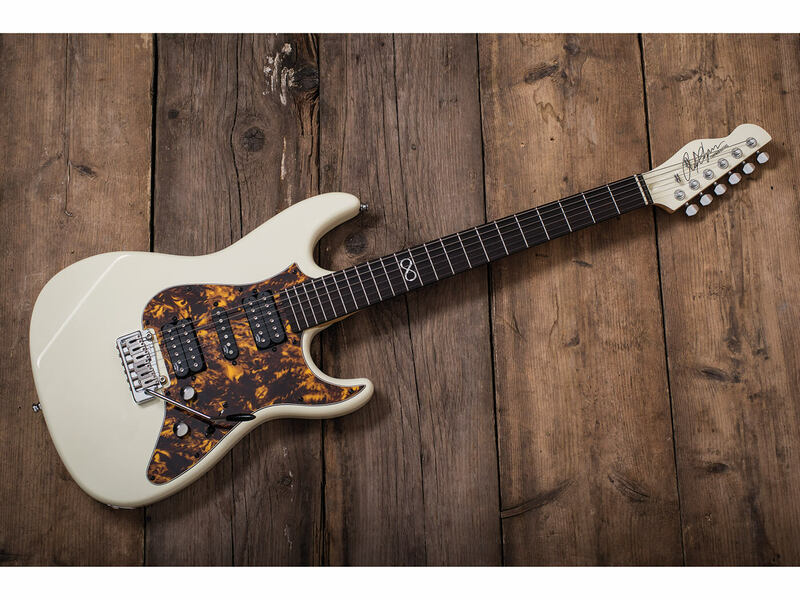 Anderton is also MD of Chapman Guitars and it was co-founder Rob Chapman who first raised the idea of producing a signature guitar for Lee back in 2013. 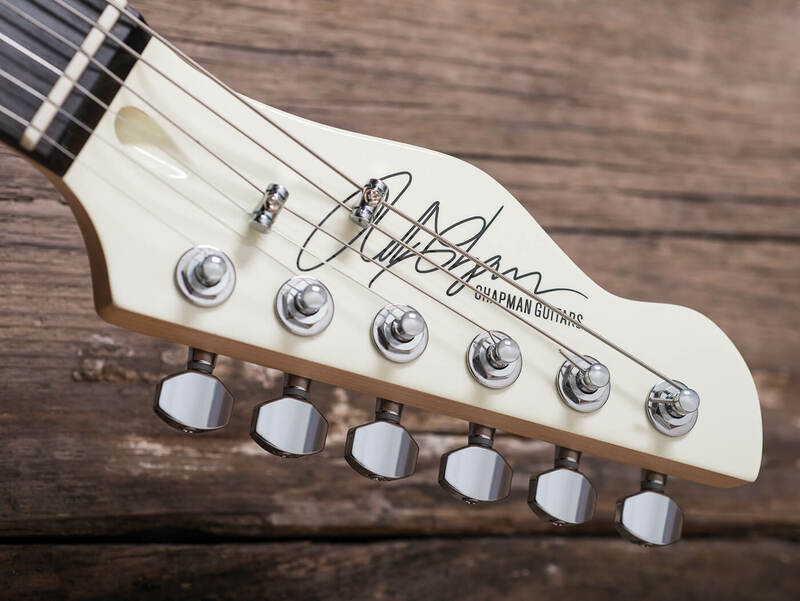 Lee was drawn to create something inspired by his trusty old Strat, but based on the shape of the ML1, one of Chapman’s existing guitars. The Strat in question is Lee’s first serious guitar – a partscaster, put together back in 1986. “I bought it in parts from a guy who’d heavily altered it, but had just never got around to finishing the project,” he explains. The CAP10 was initially produced in a limited run of 50 (the name is a reference to the ‘Captain’ moniker Lee adopts for Anderton videos) and it went on to stay in the Chapman range until the end of 2016. Fast-forward to 2018, and the latest incarnation of the CAP10 doesn’t appear to feature too many aesthetic differences, yet closer inspection reveals significant design tweaks have taken place: some instigated by Lee, some enforced by external influences. The body’s smooth contouring makes for a comfortable and familiar playing experience and the forearm chamfer feels a little less pronounced than a Strat. This results in more of your picking arm being in contact with the body. 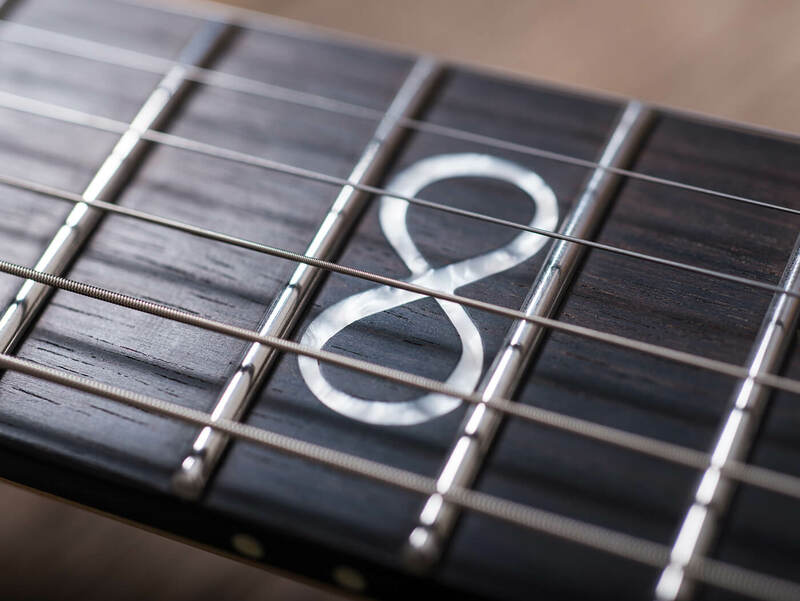 Unburdened with fret markers, apart from Chapman’s Infinity Logo at the12th fret, the unfinished dark ebony ’board looks inviting. For this writer, the less lacquered or buffed the fretboard, the more enjoyable the playing experience, irrespective of wood type. The lightly buffed playing surface offers little resistance, making bending much easier. The neck is a comfortable typical C shape, but we were surprised to measure that the fretboard radius was a fairly flat 13-¾ inches. 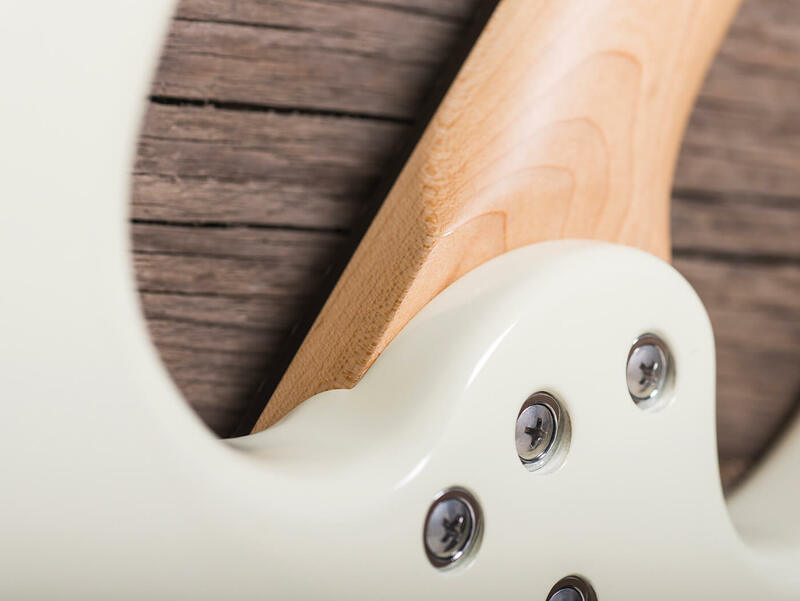 We say ‘surprised’, because it never feels particularly flat and there is always a supportive curvature present for chordal work – the illusion of curvature is likely enhanced by the impeccably rolled fretboard edges. The entire guitar arrived set up to a high standard, with perfectly crowned stainless-steel frets, no dead spots and bends of up to two tones immune to choking. We set up the two-pivot Wilkinson vibrato unit so we could pull the strings sharp and the guitar held its tuning admirably. A HSH configuration is fairly unusual for a Strat-style guitar and when plugged in, the similarities to Fender’s venerable electric abruptly end. The CAP10’s sonic properties have more in common with other guitars, despite the S-type appearance. The combination of a mahogany body and an ebony ’board produces a darker, creamier tone than the one your eyes have deceived your ears into expecting. Consequently, the sound produced by both the neck and bridge humbuckers is much more akin to archetypal Gibson or PRS tones. While not molten-hot, the bridge pickup sounds fairly overwound, which results in a slight compression that robs the guitar of dynamics on some amp settings. 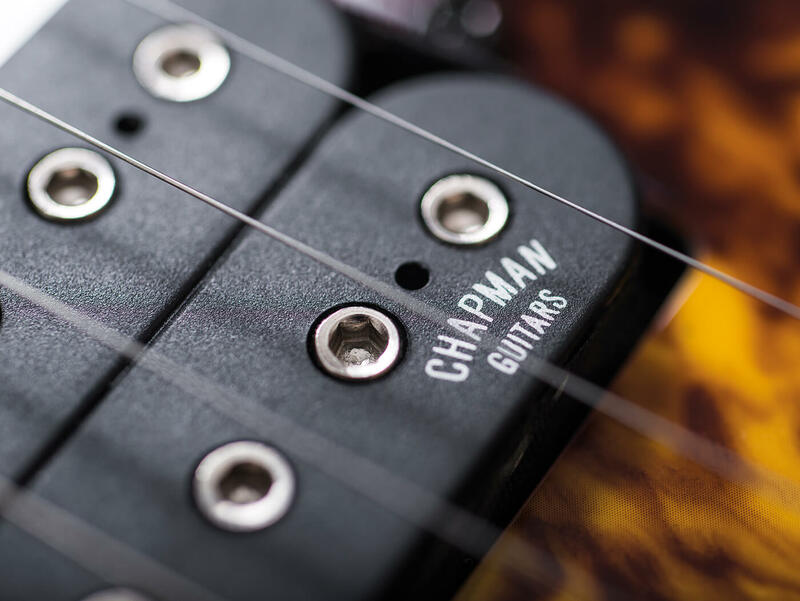 Many guitarists aren’t particularly keen on humbuckers in Strat-style guitars as they can sound a little unwieldy at times, so the relatively measured and controlled output of the Chapman pickups compared to full-on metal pickups may appeal to those players. In contrast, the neck humbucker is a little more dynamic than its counterpart and while meaty on high-gain settings, still has enough poke and punch to remind you of its primary Strat influence. Positions two and four on the five-way blade switch split the bridge and neck humbuckers respectively, and we’re provided with some musical, spanking Strat-style sounds. Times – and more importantly, prices – have changed, and as a result the CAP10’s pricing offers excellent value in 2019 compared to similarly spec’d competitors. Although it’s a signature model, the idiosyncrasies have been kept to a minimum and as a result the CAP10 is probably the Chapman model with the widest potential appeal, especially with its newly softened edges and more Strat-like demeanour. Reverse headstocks can be awkward to tune if you’re unfamiliar with the shape, and the rock-voiced bridge pickup won’t be to everyone’s taste, but the guitar does come very well set-up with a hard case thrown in. It’s an interesting take on a Strat-style design, with the shell of a classic but the engine of a roadster, providing Fender-style playability combined with fatter humbucker tones. For a Strat-style guitar with a little more under the hood, the CAP10 is a must-try.